Pinterest is often decried as one of the smaller social networks, left to the bottom rung for traffic rankings and utility for businesses. It has a “narrow” audience, it has a strange layout compared to other networks, and it isn’t as focused on engagement as other sites. Many businesses ignore it in favor of bigger networks like Instagram, Twitter, and Facebook. I don’t blame you if you’re one of the people who have discounted Pinterest in the past. It only has around 100m monthly active users, which is a quarter the size of Instagram and one sixteenth the number Facebook has. On the other hand, it has a lot to offer. On Facebook you have to fight everyone and their mother’s brand to get a piece of the pie. Pinterest, since it has been largely ignored, has a lot less competition. If you can grasp it, you can get a much higher share of the audience and you can draw in a heck of a lot of traffic. Now, the basic advice for any social network holds true here. You need to fill out your profile and actively use the site. Social media timing rules apply as well; post at the right times to catch your audience, as determined by analytics. Now, on to some more specific tips for driving traffic from Pinterest and its pin boards to your website and all of your sales pressure. The official Pin It button is a plugin provided by Pinterest that creates an overlay on top of the images in your blog posts. When a user hovers their cursor over the image, the “pin it” button appears in the upper corner. This button, when clicked, submits your link to the user’s pin boards with the chosen image as the header. It’s unobtrusive because it’s invisible until the user hovers over an image, but it’s a way all Pinterest users know to use. 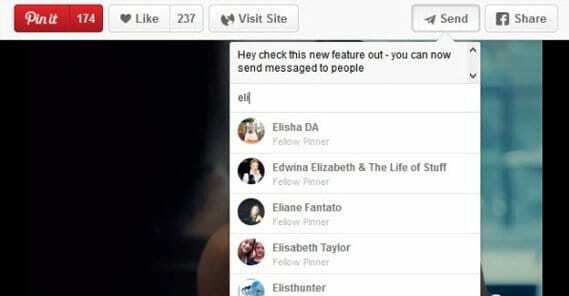 You can also have the standard Pinterest social sharing button in your lineup, of course. The benefit of the pin it button is the broad sharing of any post on your site. Any time someone wants to pin an image, they get the link as well, so anyone else on Pinterest associated with that user can then click through to your site. It’s social sharing in its best form. 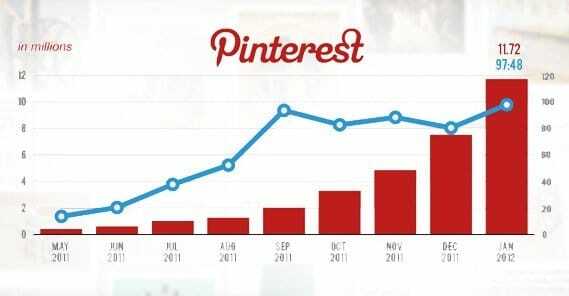 There’s actually not a whole lot of engagement on Pinterest. Your followers can see your pin boards and can pin individual items from them, and that gives you a chance to see who pinned it. A simple “thanks for the pin” can be useful, but it can also be trite; consider the person and situation before you do it. The two primary ways to engage with your followers are to pin their content and to comment on their pins. By pinning their content, you’re curating content for your own feed, which gives the rest of your users hope you’ll turn your attention to them as well. They’ll be active to draw in your attention. By commenting and responding to comments, you simply become an active person rather than a top-level brand just taking basic actions and hoping it’s enough. Whenever someone follows you on Pinterest, follow them back, so you can see what sorts of content is trending at any given time. This is important. You’re not going to want to pin the same content that’s trending all the time; chances are your audience has already seen it. Instead, take the topic from the trending pins and look around for other, similar content in the same niche. The idea is to give your followers variety, spice, and novelty rather than just showing them what they’ve already seen. As you gain followers and follow them back, you gain more access to more content in various niches that may complement your own content. You also get more inspiration and more of a broad-world view on the trends happening on the site. While you build your audience, you can watch the actual trends board. Pinterest is great for specific themes, and it’s great for visual contests, in a way that’s very similar to Instagram without the mobile buy-in. One basic idea is to create a contest board and ask followers to submit items from your store pinned to that board. Have them add a comment as to why they like the item, and then judge the results later. Pick a winner and give them something, whether it’s a gift card or the product itself. Just make sure you follow the basic rule of social contests, which is to give away something that applies to your business, not to life in general. You don’t want to attract people who are only following you for the prize; they won’t visit your site outside of contests, so they’re not valuable followers to have. 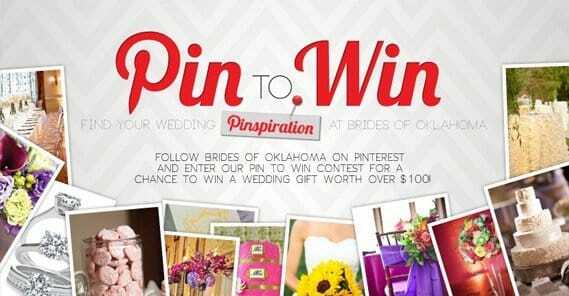 Rich pins are a type of post on Pinterest that pulls data dynamically from your site. You’ll have to do some specific code implementation, but once you have it set up, it makes managing your product pins so much easier. The idea is that the pins, when someone views them, pull data from your site for accurate availability and price information. If you tried to include that in the descriptions, you would have to edit or delete and recreate the pins every time your information changed. If a product goes out of stock, you would have to change the pin to reflect that. With rich pins, it pulls the data from your site directly, so it’s always up to date. Plus, since you’re linking to your site through the pin, the rich pin goes right to the product page for more information. There’s no functional limit to the number of pin boards you can create; it just comes down to how many you can feasibly manage at any given time. I like to create as many as seem necessary for the niche. You can have a humor board, for light hearted or mocking commentary of your industry. You can have a serious product board. You can have contest boards. You can have themed boards for events and holidays. You can have an educational board for tutorials and DIY versions of what you offer in your store. Avoid doing what novices do and making only a small handful of boards, then inflating them into unmanageable sizes with constant posts from ever-broadening definitions of what the board theme happens to be. In other words, don’t just post everything to the same handful of boards over and over. Pinterest is a very vertical format. Images have a fixed maximum width of 238 pixels wide when small, or 735 pixels wide when expanded. They have a flexible height, though, and the layout of the site will expand to accommodate them to a certain extent. Studies have shown that pins perform better when they are over 800 pixels tall, so larger, longer pins work better. 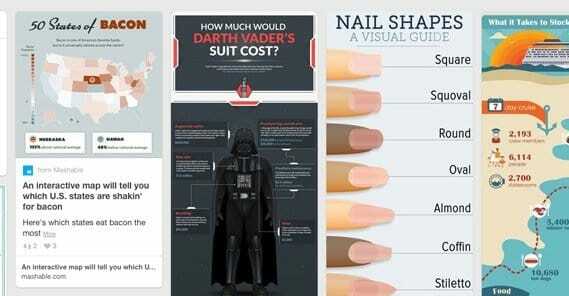 The side effect of this is that Pinterest is an excellent platform for pinning and sharing infographics. You can take an excerpt from the infographic and share it, or if it’s small enough, you can just share the whole thing. Just make sure it has excellent graphic design; none of that basic bar graphs in a grid stuff. Pinterest is a highly graphical platform, after all. You want to impress and attract the people seeing your pins, not turn into visual noise they ignore. Images are fine having text on them on Pinterest, and you don’t have to worry about anything like Facebook’s dumb 20% text rule. You’re free to post text as an image all on its own if you want, but I generally prefer adding an actual image underneath. Even if all you’re doing is sharing inspirational quotes, you can do it over top of a picture. In fact, I’ve seen some good mashups of quote and theme, like the “science facts and hot women” trend or the inspirational quotes over landscapes. If you can pick a theme for both quote and image, you too can get widely shared through the juxtaposition. Otherwise, all you need is a title and a source link on the image, and the rest of the context in the description. The name of a recipe and the finished product plus a link, for example, is all you need for a good pin; include a description of the dish and a link to your site in the description, and have the full recipe on your site. Every good marketer takes data about their posts and their performance and runs with it. To harvest this data, you need to use some kind of analytics tool. On Pinterest, you can use their native analytics and get quite a bit of data. You’ll need to use the “new look” if you’re not already, though it may have been pushed out to everyone, I’m not sure. I don’t have the space to go over everything in the analytics dashboard here, so you might as well check out the experts. This site gives you a great overview, for example. You can see a lot of data distributed over time, and you can see who is engaging with what. Pursue the spikes, downplay the valleys, and you’ll have a much better time of it. This is an interesting one, and it puts Pinterest into a firmly opposing light compared to Instagram. 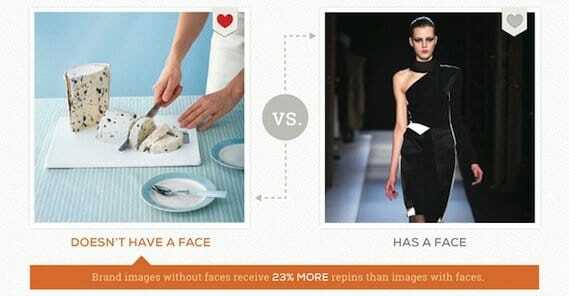 Images without faces in them – that is, images without people as the central focus – tend to get as much as 23% more repins than images that focus on faces. You can have people in your imagery, but don’t focus on selfies or the like. Unfortunately, this eliminates one of the best branded contest ideas, which is the user feature. Save that style of contest for the Instagram crowd, who are not only used to taking pictures of themselves and sharing them, but who love to share selfies of each other. 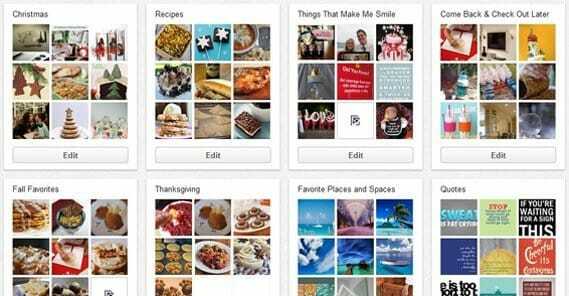 Pinterest is more for the artistic displays and the graphic design. The goal here is not to just sell the theme, it’s to push the lifestyle. You’re promoting it as an aesthetic, as a goal for living, not as just something incidental. You want to do more than just create a product board, you want to create a board that showcases a lifestyle that involves your items. This can be easier or harder depending on your brand, of course. It’s easier to create lifestyle boards when you sell a wide variety of clothing than it is to create them when you’re selling marketing software. Finally, of course, I’ll leave you with the should-be-obvious bonus tip: study and interact with influencers in your niche. Once again, Pinterest has been largely ignored by many businesses, which has led to a unique situation where there are influencers on the site that aren’t present elsewhere. Here, they dominate, and they tend to have a good idea of what they’re doing and why it works. You need to study them and get your content featured by them. Mimic them without copying them, gain their attention through repins and engagement, and try to get your pins featured in their boards. That’s how you reach a much wider audience faster than you otherwise can. James is a content marketing and SEO professional who enjoys the challenge of driving sales through blogging while creating awesome and useful content. No comments yet. You could be the first! Set your budget, target your visitors, get traffic. Drive thousands of targeted visitors to your website, online store, or affiliate links, and use powerful geolocation and interest targeting. Track your campaign daily in our reporting dashboard. Change your URL at any time and split test between multiple pages to see which performs best. Growtraffic.com is the leading pop-under traffic network. Get thousands of targeted visitors for wholesale prices.